One of the more common questions we are asked is about the modeling of periodic, or pulsed, heat loads. That is, a heat load that turns on and off repeatedly at known times. Modeling such a situation accurately and efficiently in COMSOL Multiphysics is quite easy to do with the Events interface. The techniques we will introduce are applicable to many classes of time-dependent simulations in which you have changes in loads that occur at known times. First, let’s take a (very) brief conceptual look at the implicit time-stepping algorithms used when you are solving a time-dependent problem in COMSOL Multiphysics. These algorithms choose a time step based upon a user-specified tolerance. While this allows the software to take very large time steps when there are gradual variations in the solution, the drawback is that using too loose of a tolerance can skip over certain transient events. 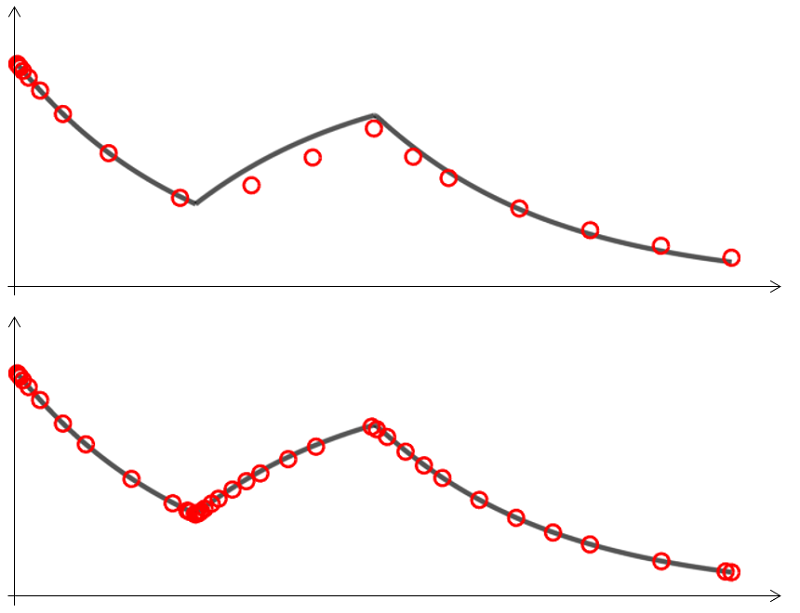 The numeric solution (red dots) is shown for a relative tolerance of 0.2 and 0.01 and is compared to the analytical result (grey line). We can see from the plot above that a very loose relative tolerance of 0.2 does not accurately capture the switching of the load. At a tighter relative tolerance of 0.01 (the solver default), the solution is reasonably well resolved. We can also observe that the spacing of the points shows the varying time steps used by the solver. It is apparent that the solver takes larger time steps where the solution changes slowly and finer time steps when the heat load switches on and off. However, if the tolerance is set too loosely, the solver may skip over the heat load change entirely when the width of the heat load gets very small. That is, if t_s and t_e move very close to each other, the magnitude of the total heat load is too small for the specified tolerance. We can of course mitigate this by using tighter tolerances, but a better option exists. When using Explicit Events, the numerical solution — even with a very loose relative tolerance of 0.2 — compares quite well with the analytical result. Away from the events, large time steps are taken. The above plot illustrates that the Explicit Events force a solution evaluation when the load switches on or off. The loose relative tolerance allows the solver to take large time steps when the solution varies gradually. Small time steps are taken immediately after the events to give good resolution of the variation in the solution. Thus, we have both good resolution of the heat load switching on or off and we take large time steps to minimize the overall computational cost. Now that we’ve introduced the concepts, we will take a look at implementing these Explicit Events. 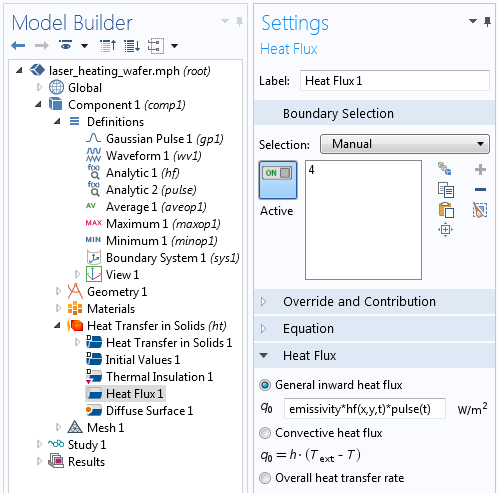 We will begin with an existing example from the COMSOL Multiphysics Model Library and modify it slightly to include a periodic heat load and the Events interface. We will look at an example of the Laser Heating of a Silicon Wafer, where a laser is modeled as a distributed heat source moving back and forth across the surface of a spinning silicon wafer. to evaluate pulse (t) to zero between t=2-3 seconds, and one otherwise. The Periodic Extension option is used to repeat this pattern every five seconds, as shown in the screenshot below. The settings used to define a periodic function, as plotted. The settings for the applied heat flux boundary condition. The last thing that we need to do is to add the Events interface. 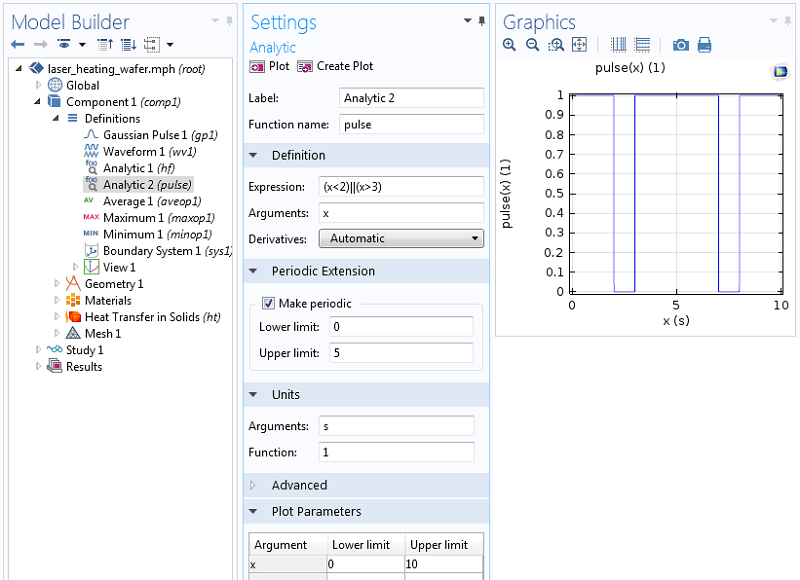 This physics interface is found within Mathematics > ODE and DAE interfaces when using the Add Physics browser. 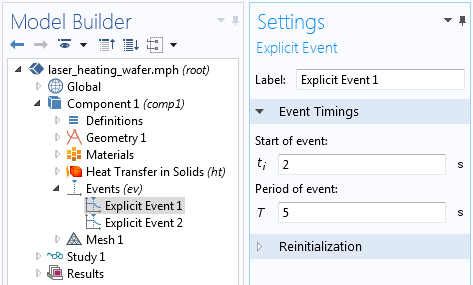 Within the Events interface, add two Explicit Events with the settings shown below to define a periodic event starting at two and three seconds and repeating every five seconds. The Explicit Events settings. The second of these events starts at 3 s.
The settings for the time-dependent solver. Note that the entries in the Times field are the output times. These settings do not directly control the actual time steps taken by the solver. The Relative Tolerance field (default value of 0.01) along with the Events — if they are in the model — control these time steps. A comparison of unpulsed (left) and pulsed (right) heat loads. You can compare the results of this simulation to the original model to see the differences in temperature across the wafer. With a periodic heat load, the temperature rise is more gradual and the temperature variations at any point in time are smaller. 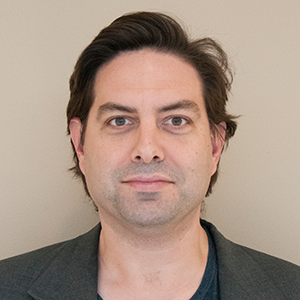 We have looked at using the Events interface for modeling a periodic heat load over time and introduced why it provides a good combination of accuracy and low computational requirements. There is a great deal more that you can do with the Events interface — if you would like to learn more, we encourage you to consult the documentation. An extended demonstration of the usage of the Events interface is featured in the Capacity Fade of a Li-ion Battery example from the Model Library. On the other hand, when dealing with problems that are either convection dominated or wave-type problems (e.g., fluid flow models or transient structural response, respectively), then we would not want to introduce instantaneous changes in the loads. The reasons behind that — and alternative modeling techniques for such situations — will be the topic of an upcoming blog. Stay tuned! One thing though: I do not read anything hereabove about the the relation between mesh density, that links to the material heat diffusivity “alpha” equal to k/rho/Cp and the time steps used. If one does not also carefully consider these variables, there is a good chance that the errors you describe in the beginning are driven mostly by a poor mesh density. I have noticed that you now propose the heat diffusivity “alpha” as a COMSOL internal variable, but I have not read anything that the mesher analyses this to adapt the mesh accordingly yet (automatically). Or have I missed a new feature ? Yes, you are correct, one should always perform a mesh refinement study, as well as a study of the refinement of the time-dependent solver tolerance. 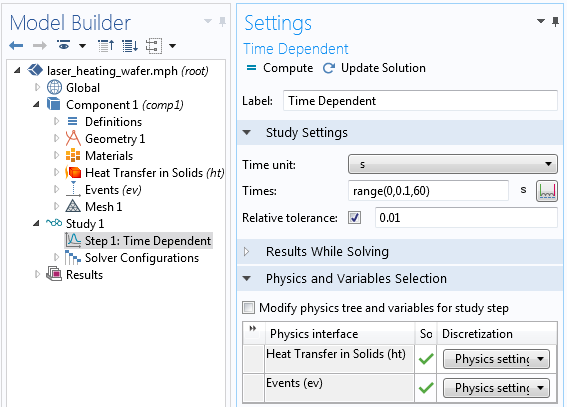 Do keep in mind that the advantage of the Events interface is that it will ensure proper temporal resolution of the periodic heat load, *regardless* of the mesh size or the time-dependent solver tolerance. Also, the first example presented here is a single degree of freedom problem, so there is no mesh dependency. With respect to “alpha”: It appears that there are some misunderstanding here, and it is not particularly germane to this discussion about the usage of Events. With respect to how you do the mesh refinement: You can perform either manual refinement or automatic adaptive mesh refinement. Adaptive mesh refinement in time-domain simulations has been available since several versions ago. I am working on ultra-short pulse laser matter interaction model in COMSOL (pulse duration <1ps). In order to run simulation in time of 100fs, do i need the work station. How i can chose the system configuration (processor, ram). please suggest system requirement to solve my problem. Such questions should be directed to your COMSOL Support Team. Many thanks for your blog, it’s very usefull for me. I have a question related to using explicit events. I made a model which simulated material heating by one laser pulse and I did it by defining a initial temperature in focal spot. I wanted to simulate pulse train and added analytic function, two explicit events and multiply initial temperature in focal spot on analytic fucntion. Was it enough? Cause I expected to see graph T = f(t) like yours, but I didn’t. Thank you for your interest in this blog post! For questions related to your simulations, please contact our support team. If I need to make pulses that are 100E-6 seconds in length, and they repeat once every second. How would I do this? I tried using this method but it doesn’t work for very small pulses. You may want to double-check your implementation, as this method does work for any pulse duration. You can confirm this by looking over the solver log. You mentioned a flow-up blog post regarding alternative methods for dealing with instantaneous loads. Can you provide a link to that post, I can’t seem to find one that meets that description. The load I’m applying is a stepped load (like a staircase). Currently I’m using voltage = V_step*floor(t/period) to achieve this staircase. Because I’m using the floor function, I don’t believe the derivatives are continuous. How can I implement a staircase-like load that has continuous 2nd derivatives and is smoothed as you recommend? I’ve tried to use the built-in functions (i.e., step, analytic, piecewise) and combinations thereof without much success. Along with my floor function, I’ve also defined events to occur at the same time as the voltage steps (i.e., my period). This was successful in making the voltage follow the staircase voltage profile as I defined (even when I reduce the tolerance to 0.1 – 2hrs to run). However, the current still increases non-physically beginning one or two time steps prior to the subsequent step in voltage (even with a tolerance of 0.001 66 hrs to run). I’m hoping that the smoothed load will help reduce this problem. If not, what should I do? If I do implement the smoothed staircase, should I continue to use the explicit event? If so, when should I define the event? Should it be at the start of middle or end of the voltage step? Finally, I’d like to run the data up to 50000 s, currently I’m running 1000 s with a step of 1 s. Increasing the length will increase the size of the results file which is already approaching 9 GB. Since I only care about the data just before and just after a step, how can I make the solver solve for those points only? During the voltage plateau, the system approaches a fairly steady state condition. This is an excellent explanation, just what I was looking for. thanks a lot for another great post. I like all your posts so far and they are extremely helpful. You mentioned that the alogrithms for solving time-dependent problems “choose a time step based upon a user-specified tolerance”. How does this looks like in a frequency-domain study? For example, suppose I have some high-frequency function within my model. How do I “feed” COMSOL with the correct information in order to avoid a kind of “aliasing”, i. e. COMSOL “sees” the function correctly? frequency domain studies. Maybe I understood it wrong. Thanks a lot for good helping post. Can you kindly explain what is hf(x,y,t) in expression q0 of heat flux 1 settings window?